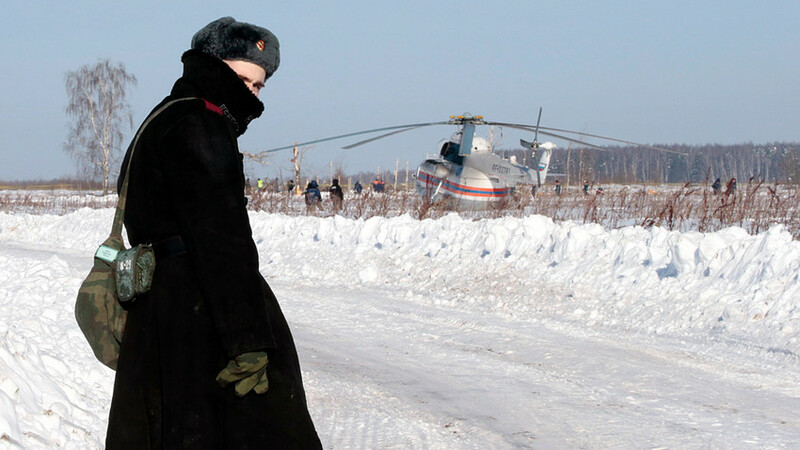 A Russian serviceman looks back as he stands guard during a search operation near the crash site of the short-haul AN-148 airplane operated by Saratov Airlines in Moscow Region. A Russian An-148 passenger aircraft crashed 80 km (50 miles) from Moscow 11 February five minutes after take-off, killing all 71 passengers and crew on board. The passenger jet vanished from radar a couple of minutes after take off from Moscow's Domodedovo airport, crashing and leaving debris strewn across snow-covered fields near the small village of Argunovo. Investigators currently have no idea what caused the crash. Police are questioning the airport controller responsible for the flight take-off. "The plane’s captain didn’t report any malfunctions. Yet as the plane gained altitude the aircraft started falling down", the air traffic controller reportedly told police. An initial suggestion that the plane collided with a helicopter before crashing has been dismissed, as no debris other than that of the AN-148 has been found at the scene of the fatal accident. Personnel work at the scene of a AN-148 plane crash in Stepanovskoye village, about 40 kilometers (25 miles) from the Domodedovo airport, Russia. Russian pilots point out that in the immediate aftermath of the crash it would be premature to talk about possible causes, as the reason could be anything from a terrorist attack, to human error, to a technical fault. A former Boeing-777 pilot, who has asked not to be named, told Russia Beyond he thinks poor weather conditions and a technical fault are most likely behind the disaster. "There may have been an engine failure or a fire on board - or the aircraft may have been subjected to icing conditions, resulting in a wing stall and, consequently, loss of control," he said. Vladimir Putin has offered his condolences to the families of victims onboard An-148 and said a special commission will be set up to investigate the tragedy. 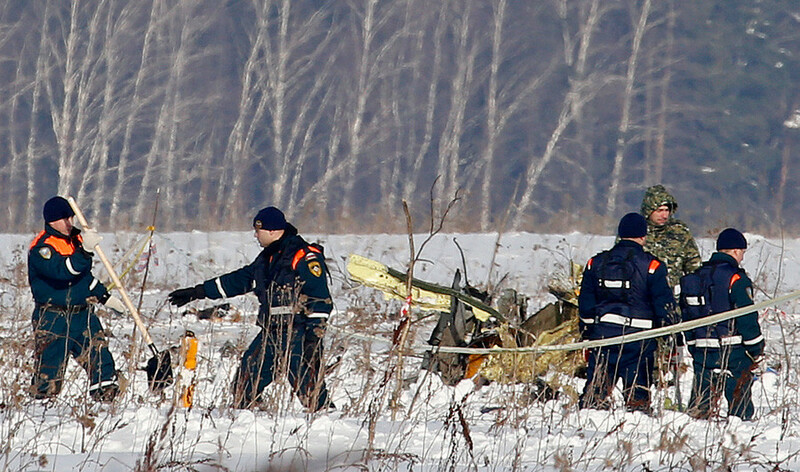 Some Russians believe the plane crashed as a result of a terrorist attack. Чтобы спокойно летящий, практически набравший высоту самолёт просто так взял и упал... Крыло отвалилось? ЧТО??? — Geo Mysl (@geomysl) 11 февраля 2018 г. "Why would an aircraft which has already ascended suddenly fall to the grounds?... Did a wing drop off? WHAT??? Even if two of its engines failed, THAT aircraft had every chance of landing in a field…A terrorist attack?" wonders @geomysl on Twitter. Others also expressed their shock. "It really hurts. Six months ago, I flew this airline with my little daughter, and now my whole life flashed before my eyes. I do wish it that all aircraft have peaceful landings, equal in number to take-offs. Fly safely. Orenburg, we are with you," wrote Twitter user @skylove_aviaphoto.